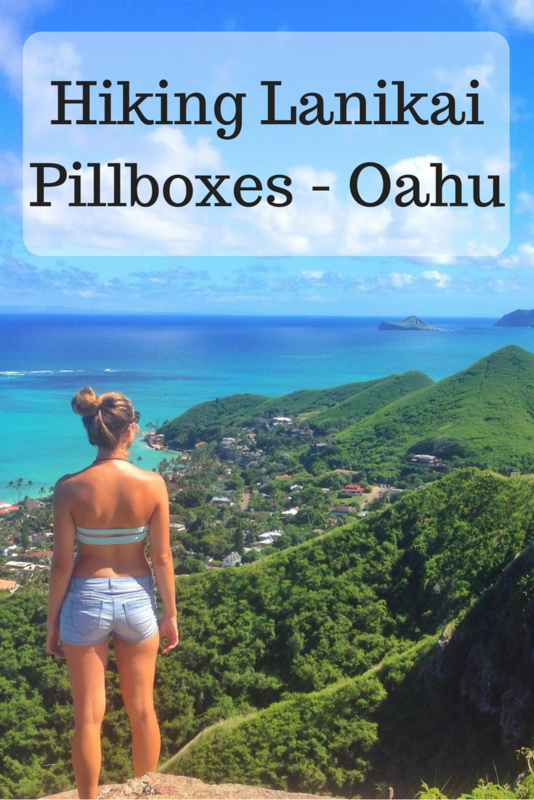 Lanikai Pillboxes trail is one of the most scenic hiking trails on Oahu and my personal favourite. The short hike rises just above beautiful Lanikai Beach rewarding hikers with some of the best views of Oahu’s windward coastline. Although the trail is short, the reward is huge! This blog will tell you everything you need to know about hiking Lanikai Pillboxes, also known as the Kaiwa Ridge Trail. Although the Lanikai pillboxes trail is short, it is steep in spots and can be challenging for some. The trail leads you to three pillboxes. You can reach the first pillbox in 20-30 minutes, the second pillbox in another 5 – 10 minutes and the third in another 10-15minutes. Total time to the third pillbox at a slow pace is 1 hour. I recommend going to all three. The trail is exposed so make sure you wear sunscreen and a hat. The trailhead is on Kaelepulu Dr, Kailua. If you type Lanikai Pillbox into Google Maps it will come up, or you can follow the map below. From Waikiki, it is a 40 minutes to drive to the Lanikai Pillboxes trailhead. On weekends it can be very hard to find a park, so as soon as you enter the Lanikai Beach area park anywhere you can and walk to the trailhead from there. By bus, it will take over an hour. From the Ala Moana centre, take bus 56 or 57, then transfer onto bus 70 in Kailua. The trailhead is just off the street, across from the Mid Pacific Country club. It is easy to find and if you are unsure you can always ask someone. For the Lanikai Pillboxes Trail, I suggest packing water and snacks. I guarantee that when you get to the top, you won’t want to come down, the view is too incredible to leave. Sunscreen and a hat, the trail is completely exposed. The nearest bathrooms are at Kailua Beach Park. While you are in the Lanikai area, make sure you check out Lanikai Beach, Kailua Beach and Makapuu beach and lighthouse. You may also wish to stand up paddleboard or kayak out to flat islands or the Mokulua Islands. These are the islands you can see while hiking the Lanikai Pillbox trail. On a windy day, you will see kite surfers offshore from Lanikai, and this is also something you can try if you dare. See more from Hawaii here.